Ah, a baby sister. You ask for one. Your mom finally tells you that one is on the way. You wait and wait for one and then she gets here and. . .she really doesn't do much. Yes, she's pretty and little and it's nice to hold her and feel like a big girl, but really, baby sisters can be such a let down. They don't want to play with you. They put your toys in their mouths. They take up a lot of Mommy's time, and to what end? As much as you love them, they still really are a lot of work for seemingly so little reward. Coryn is a very good big sister, but even she doesn't quite know what to do with Claire. So many of my activities that I do with Coryn now seem to be things I'm doing to make up for time spent with Claire, as if I'm compensating for having a baby. As if they were two separate charges rather than a set of sisters. Sometimes we try to play together. We have dance parties where I hold Claire up and bounce her up and down so Coryn can dance "with" her. I'll let Coryn pick out Claire's outfit, help with Claire in the bath, or just ask her to talk with Claire while she's lying on the floor chilling. . .but more often than not now, Coryn responds to Claire time as if it were chore time. The baby sister honeymoon is over. Now it's all about, "Mommy! She's eating my toys! No, I don't want to play with Claire! Can you put Claire down and read me a story?" So last night I was playing with Claire while Coryn was playing with her toys in her room. I started to rub Claire's legs and she liked that, and some bizarre part of my brain thought, "I bet she'd like being drawn on with markers." I told you it was a bizarre part of my brain. But you know what? Bizarre or not, she loved it! I took one of Coryn's crayola washable markers and drew circles on her leg while she sat entranced. My bizarre brain kept spinning and I thought, "You know, Coryn would love this!" So for the next fifteen minutes or so, Coryn decorated her baby sister. It all came off in the bath, but Coryn thought it was pretty awesome. It also led to a photo session of my two girls goofing off on the computer room floor (I gave Claire a marker with the cap on for her to chew on. She has sprouted several new teeth in the last week and they're bugging her a lot). I did have a moment of, "Oh gosh, this was a bad idea" when I put her in the bath and for a moment some of the marker looked as if it wasn't going to disappear completely, but then it faded away, the water turned slightly blue and she was clean again. A baby sister is much more fun when you can draw on her. Hahaha! This was so funny! 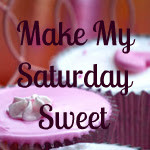 Thanks, Heidilyn, for linking up at the Make My Saturday Sweet blog hop!